Chateau Peyrepertuse, which translates roughly into (tee hee) Stone-Whooping cough Castle—the spectacular mountaintop ruin of a former Cathar fortress, then French-border fortress and chapel to Saint-Louis/Louis IX, north of the town of Maury, in the Aude. Peyrefitte-du-Razès—a farming village in the Razès region of the Aude, where we’ve hiked. 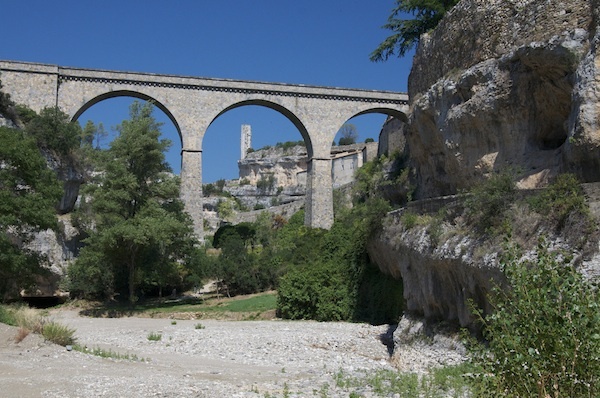 The double-hitter Peyrie-et-Peyrols—a hamlet near Mirepoix. 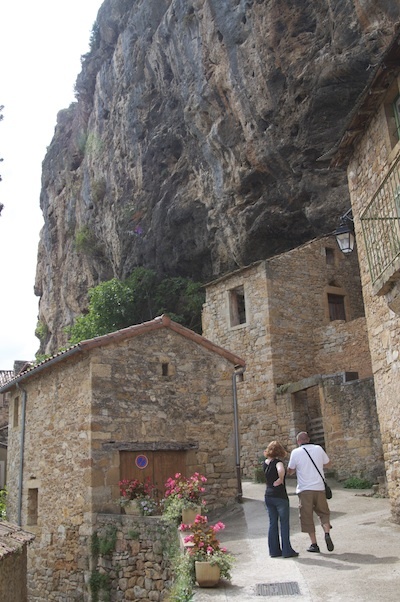 La Peyre—a village built into the cliff, close the the Millau Viaduct in the upper Tarn. These kinds of places, in which past architects and builders took advantage of how rivers now far below had eroded overhangs, caves and natural shelters out of their former banks to erect shelters, Anasazi-style, are called villages des troglodytes, or villages of the cave dwellers. The original church in La Peyre, now a private residence and art gallery, is once of the cave dwellings. 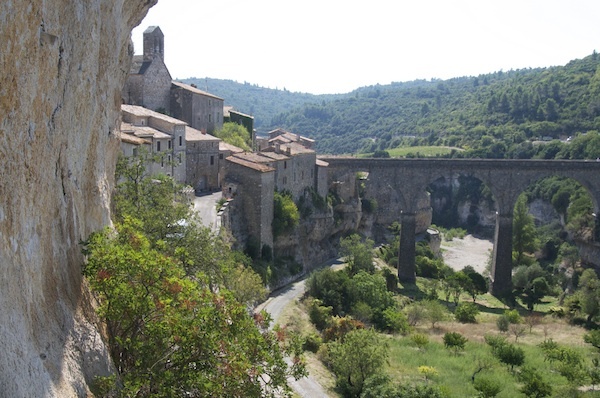 One of the most renowned troglodyte villages in southwest France is Minèrve (in the Minèrvois region of Languedoc, funnily enough). Alerted to its potential by the two stars the Michelin road map marking its name, we visited this cliff-village after we picked up our month’s supply of wine from our favourite winery just to the south. We had lunch in the riverbed, the river flowing underground for most of the year.